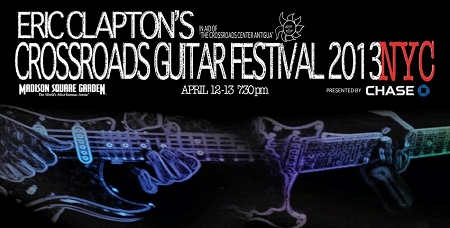 Crossroads Guitar Festival 2013 – TONIGHT! One of my students recently celebrated a birthday. The day before her birthday was the “day of anticipation.” I thought that was an elegant way to describe her excitement, and, with all the credit to her, I will now sample the phrase and admit that this moment is of potent anticipation. In less than five hours, I will be among a full crowd of music lovers for Eric Clapton’s Crossroads Guitar Festival 2013 at Madison Square Garden. As I wrote back in November, my buddy Josh and I have envied those who attended past Crossroads festivals (watching videos of the ethereal artist combinations) since Clapton first started this charity concert. Now, finally, we will attend (the concert is in our backyard, so to speak). While I have seen Clapton three times, I am assured that tonight will be a different experience. The line-up is freakishly good. The concert, which will run for 4.5 hours, will be the best representation of musical firmament. As you can tell by my effusive excitement, I am ready for this show. It is also wonderful to be supporting Clapton’s Crossroads Centre in Antigua. Clapton was once afflicted with addiction, and the Crossroads Centre was founded in 1998 to provide treatment to addicted individuals. The festival proceeds tonight support the centre. You can follow the Crossroads Social Media feed on Facebook and Twitter. If you were lucky enough to score tickets to the show (it was a harrowing experience, trust me), ENJOY! I will be there rocking out from my seat. Be sure to expect a review of the show in the coming days. It’s a great show. I saw it a few years ago, and it was the kind of lineup you’d have to spend hundreds (if not thousands) to see all of them live.